Frank Dannenhauer is an experienced executive and leader of major transformations. He has over 20 years of experience in the pharmaceuticals, chemicals and consumer health industries, as well as a background in public sector and not-for-profit organisations. Throughout his career he has lead teams in 45 countries across the globe. He has extensive experience in designing and implementing major transformations, namely shifts of strategy, new organisational structures, acquisitions, downsizing and implementation of business-IT programmes. Frank has a strong track record in leading through change and keeping large-scale transformation programmes honest. He understands how to build the organisational capabilities for the future, especially in an international and complex environment. Based on his international leadership experience and his degree in change management, he acts as an independent thought partner in times of difficult choices. Prior to becoming a consultant, Frank had a long and successful career with Merck KGaA, a leading pharmaceuticals and chemicals group. He was responsible for digital strategy alignment and IT operations as the divisional CIO for the Pharmaceuticals and Consumer Health divisions on a global basis. Frank has successfully led a number of major restructuring, downsizing and acquisition programmes. Before that he developed deep business and IT insights at Merz + Co., a pharmaceuticals company in Frankfurt, as well as at the City Council of Mannheim in his native town in Germany. The Changing Role of Leaders for the Digital Age. 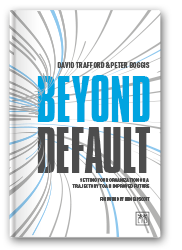 A chapter co-authored with Peter Boggis and David Trafford, in The Palgrave Handbook of Managing Continuous Business Transformation. Frank is based in the Geneva region of Switzerland and advises clients around the world. He holds a Diploma in Business Administration as well as an MBA and a Masters Degree in Change Management from INSEAD, France.